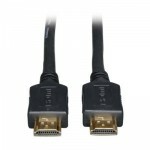 Tripp Lite's 15.24 m (50-ft.) Standard Speed HDMI (High-Definition Multimedia Interface) Gold Cable allows interconnection between digital display devices, such as DTV's (Digital Television), Plasma displays, LCD TV's and projectors, to Digital source devices, such as Digital Set-Top boxes, Blu-Ray players and AV receivers. Supports iPad2 Video Mirroring when used with Apple Digital AV Adapter. HDMI assures that the best audio/video signal is always sent from the source (HDTV signal, Blu-Ray Player) to the display (Projection Television, LCD, Plasma, etc.). It does this by allowing uncompressed video and multi-channel audio data to be input to the display device through a single cable. 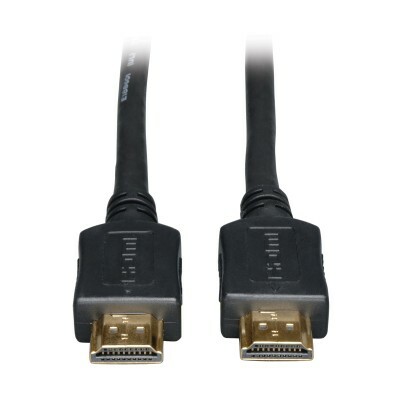 An HDMI connection allows input at standard rates of speed, up to 10.2 Gbps. In most applications, a signal booster (B122-000-60) will need to be used with this cable to ensure a signal strong enough for your display.